Travel bookings with SouthAfrica.TO qualify to earn our exclusive travel vouchers. Email a writeup of your travel experience and photos to travel@southafrica.to and we'll send you travel vouchers to reduce the cost of your following flight or cruise reservation booked with us. The higher the quality of the writeup and photos the more the vouchers. Whilst a South African airline is no longer in the top spot, Kulula took home second prize in the Skytrax 2017 awards. This makes them the best low-cost carrier in South Africa! With almost 140 votes cast giving them an average score of 4,9 Mango Airlines is still the highest ranking domestic airline! If that doesn't convince you, perhaps their latest review will: "I recently flew to Zanzibar with Mango with my family of four. I was not really looking forward to flying for 4 hours plus on a budget airline, but my oh my my, was I pleasantly surprised! The check in was quick and professional, the flight was on time, the seats were comfortable with loads of leg room, and the cherry on top was the cabin crew. They were professional , efficient but what set them apart was the sense that they were really enjoying what they were doing - all with a great sense of humour! Thank you Mango - looking forward to flying with you again one day!" 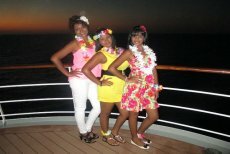 "
Jenny Padaychee and her family enjoyed their cruise on the MSC Sinfonia from Durban to the Portuguese Island. Looking for something cheaper than flights? Greyhound offers routes to destinations within South Africa as well as to Mozambique and Zimbabwe. Portuguese Island is situated off of the coast of Mozambique, and is compromised of pristine stretches of beach skirted by the warm waters of the Indian Ocean. Book your cruise to Portuguese Island from Durban. 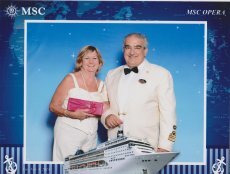 Expect loads of photos to be taken on your cruise with MSC. They're expensive, but well worth it for the memories. In a first, a passenger walks off his flight with only one shoe after some shenanigans from the EP cricket team. An awesome experience on our first ever cruise on the MSC Sinfonia. 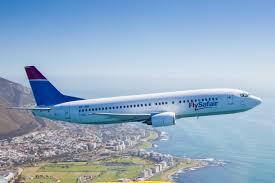 FlySafair has the best over-all on-time score of all South African airlines. They are the most on-time in November at all three major airports in South Africa scoring an average of 95%. 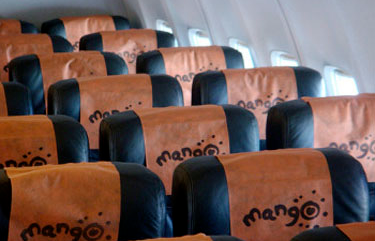 Mango Airlines has taken over from SA Express, to become the best rated airline with an average of 4.9 out of 5. FlySafair was Voted the Most On-Time Airline in the World for 2017! 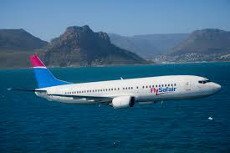 FlySafair has taken the top honours for on-time performance in 2017 as voted by the OAG! It looks like the airline is well on track to take the top honours again. They scored an average on-time rating of 93,4% for November 2018. The MSC Musica is cruising South Africa's shores until April 2019. A New multi-story parking lot at Lanseria Airport in Johannesburg has added an additional 1000 covered parking bays. This will offer protection to motor vehicles during storms. Turkish Airline will move from Ataturk to the new Istanbul Airport on the 6th of April 2019. Flights scheduled for Ataturk will move to Istanbul Airport once the move has been completed. This could result in flight cancellations. After completing the online check-in process FlySafair passengers can choose to send their electronic boarding passes to their phone through Whatsapp. The airline's court application got dismissed yesterday. This doesn't leave the airline with many viable options in order to resume operations. It's often cheapest for tourists to SA to purchase a local SIM card on arrival in the country. The French Airline recently announced that the end of their low-cost airline is near and that they will integrate JOON's staff and aircraft into Air France. No fixed date has been set for the last JOON flight. FlyCemair took the South African Civil Aviation Authority (SACAA) to court in order to fight the suspension of their Air Operator Certificates. The court ruled in Cemair's favour and the airline returned to the skies on the 20th of December 2018. An interline agreement between South Africa's most on-time airline and KLM/Air France will allow passengers a seamless connection. Former chief financial officer Marelize Labuschagne has replaced Nic Vlok as CEO of Mango Airlines. She has been with the airline since 2013 in the financial department and is looking forward to implement the three-year business plan. You can now enjoy intra-continental business class service on selected Airlink flights. Standing in a long queue to board a flight might just become a thing of the past with Kulula's amazing new option. Fork out a little more and enjoy the royal treatment. If everything goes according plan, we'll see SA Express return to the skies sooner rather than later! They've indicated that they will resume operations on some of their routes on the 23rd of August 2018. Africa's first low-cost airline that charged additional fees for everything from onboard snacks to checked baggage will now include these along with selected drinks in all their airfares. If everything goes according to plans we could soon see FlyAfrica return to the sky! Mark the 15th of August 2018 in your diary and keep an eye here for further updates. Unfortunately this is not the first time we've heard of plans to resume operations. Book domestic and international flights on South Africa Travel Online and pay at your nearest Pick 'n Pay store. No 3D secure credit card needed! Follow these simple steps to your dream holiday! The airline announced today that their Cape Town - Pietermaritzburg route will be suspended on the 1st of October 2018. Treat yourself, family or friends with these incredible prices for your cruise holiday on the MSC Musica. Book a cabin and pay for 2 passengers and the other 2 passengers in the cabin cruise for FREE*!. The special is available till 20 July 2018 and some cabins have sold out already. Book now so you don't miss out. *Limited availability, prices are subject to change. There are only a handful of cabins left on the MSC Musica Grand Voyage from romatic Venice in Italy to Durban. This cruise comes highly recommended by all that sail on it. Be sure to book yours before it's too late. *Limited availability, prices are subject to change. Spend a night in Lisbon, Portugal before boarding the MSC Preziosa for a 9 night cruise with stops in Spain, Italy, France and Morocco, before flying back to Johannesburg. *Limited availability, prices are subject to change. Passengers travelling on Air Seychelles after the 1st of July 2018 should check Air Seychelles new baggage policy. The airline recently announced that they are switching from the piece concept to the weight concept. Celebrate the Dad in your life and spoil him with a visit to picturesque Pomene, an idyllic and unspoilt part of Mozambique on board the MSC Musica. Experience the golden beaches, turquoise sea, mangroves and blow holes. This piece of paradise is a must visit on the cruise itinerary. *Limited availability, prices are subject to change. Save on flights between Lanseria - Cape Town and Lanseria - Durban. Book flights before midnight on the 13th of June 2018 to save on travel until the 31st of July 2018. If you are looking for a weekend getaway, then a cruise is the perfect way to have a break without using up all your precious annual leave! Contact us today and secure your place on the MSC Musica. Be one of the first to sail on her in SA waters! *Limited availability, prices are subject to change. Spend two nights in Valencia, exploring Spains third largest and sunniest city. 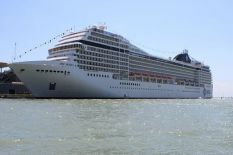 Then board the MSC Divina for a 9 night cruise with stops in Italy, France and Palma de Mallorca before flying back home. *Limited availability, prices are subject to change. Book your Mediterranean cruise with the Royal Caribbean for a 9 night discovery of New England and Canada. Starting and ending in New York. *Limited availability, prices are subject to change. 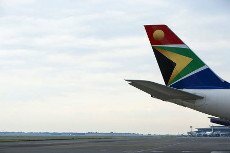 The South African Civil Aviation Authority has suspended all SA Express flights due to "serious non-compliance." This is effective immediately. We all need a good bargain and for local cruise from South Africa, we have the best for you. We have put together a list of cruises aboard the MSC Musica for the 2018/2019 cruise season where we still have cabins available for under R5500 pps*. *Limited availability, prices are subject to change. It may seem that the end of the year is very far away, but don't wait to book your November or December cruise. They are the most popular dates and sell out relatively quickly. Often by the middle of the year, we no longer have available cabins. Contact us today to secure your place on the MSC Musica. *Limited availability, prices are subject to change. Longer cruise = more time to relax! Visit picturesque Pomene, an idyllic and unspoilt part of Mozambique, Portuguese Island, Maputo or cruise all the way to Mauritius and Reunion on board the MSC Musica with one of our cruises offers that are 4 nights or more. *Limited availability, prices are subject to change. Visit picturesque Pomene, an idyllic and unspoilt part of Mozambique, Portuguese Island or cruise all the way to Venice on board the MSC Musica. With golden beaches, warm sea, mangroves and a plethora of activities, you'll have a hard time deciding what to do next! *Limited availability, prices are subject to change. Find everything you need to know about Alitalia's new flights between Johannesburg and Rome here, including luggage allowances, flight schedules and connecting destinations. Don't miss out! We have two offers for you today - the Upgrade Wave Promotion, where you get a balcony cabin for the price of an inside cabin and the Worker's Day promotion - fantastic reduced rates for the 12 November 2018 departure. *Limited availability, prices are subject to change. We all need a good bargain and for local cruises from South Africa, we have the best for you. Book today for the 2018 /2019 cruise season on the MSC Musica and luxuriate on board in the splendour of the ship on her first and only season in South Africa. *Limited availability, prices are subject to change. Get your slice of paradise with a choice of 2 excellent value 7 night fly and stay packages. Think of gorgeous beaches, exotic spices, catamaran cruises, snorkeling and palm trees gently blowing in the breeze, then add in you - to perfect the scene! *Limited availability, prices are subject to change. Air France's subsidiary airline Joon recently started operating flights between Cape Town and Paris Charles de Gaulle. Find out everything you need to know about the airline before heading to the City of Lights. There are only a handful of cruises from Cape Town for the 2018 / 2019 season aboard the MSC Musica. With the popularity of these cruises we highly recommend booking your cabin sooner rather than later. *Limited availability, prices are subject to change. The South African Road Passenger Bargaining Council is embarking on a strike. Greyhound, along with MyCiti and Golden Arrow, have confirmed that they have suspended all operations for the 18th of April 2018. More airlines will likely have to suspend operations. Visit picturesque Pomene, an idyllic and unspoilt part of Mozambique on board the MSC Musica. With golden beaches, turquoise sea, mangroves and blow holes, this piece of paradise is a must visit on the cruise itinerary. *Limited availability, prices are subject to change. This BRAND NEW cruise destination for the MSC Meraviglia is sure to thrill all travellers with mountains, lakes, glaciers and forest. Canada's beauty is something which you should behold at least once in your life. *Limited availability, prices are subject to change. Air France's low-cost subsidiary launched direct flights between Cape Town and Charles de Gaulle on the 3rd of April 2018. Kick your cruise experience up a notch by taking advantage of the Sunset Balcony Promotion and booking your balcony cabin today at these reduced prices. The special is running in selected cruises for the upcoming 2019 / 2019 SA cruise season. *Limited availability, prices are subject to change. Book a sweet holiday in a suite for you and your loved ones. Why book a suite you may ask? They are the biggest cabins on the ship; they have a bath and a shower; they have lots of extra cupboard and storage space; and of course, they have their own balconies. *Limited availability, prices are subject to change. 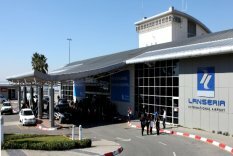 From the 29th of October 2018 El Al will operate five flights per week between Johannesburg and Tel Aviv. Virgin Atlantic are adding a second daily flight between Johannesburg and London from the 28th of October 2018. Tickets will be on sale from the 24th of March 2018. Brand New Sale! | 24 Night Cruise From Only R20,245 pps*! Hold the boat! We are so excited to offer you this opportunity to get aboard the MSC Sinfonia on her final cruise from Durban to Venice Italy. Play Super Bingo and get a guaranteed cabin on the ship, without being able to choose your cabin category. BUT you could be assigned any cabin from an interior cabin up to a balcony cabin! Your cabin will be assigned 7 days prior to sailing. *Limited availability, prices are subject to change. We've rounded up the cheapest flights to Cape Town from Durban for the Cape Town Jazz Festival on the 23rd of March 2018. There are only a handful of cruises from Cape Town for the 2018/2019 season on the MSC Musica. These cruises are extremely popular, so we highly recommend booking your cabin sooner rather than later. *Limited availability, prices are subject to change. SA Airlink has suspended all flights between Cape Town and Pretoria from the 8th of May 2018. Be awed by the history of mysticism of India, discover the ancient traditions of Muscat and wonders of Dubai with this fly and cruise package to the United Arab Emirates, Oman and India. *Limited availability, prices are subject to change.